20% OFF Citylife Face and Eyes Sorbet Cream when you book the CITYLIFE Facial. Daily stresses and environmental effects starting to take their tole on your skin? 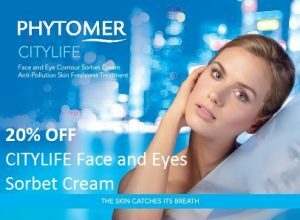 Introducing CITYLIFE, Phytomer’s Anti-Pollution Skin Freshness Treatment. Book your Citylife Facial and receive 20% the Citylife Face and Eyes Sorbet Cream. Print this coupon to receive savings. Not applicable with gift card redemption or in combination with any other offer. What is Citylife? This new treatment is ideal for people having a stressful lifestyle in a polluted environment resulting in a loss of skin radiance due to multiple daily aggressions. It uplifts the skin by the skin by targeting signs of tiredness, dark spots, dark spots and dull complexions.